Please click on the cover graphic to access the electronic copy or fill out the form to have paper copies mailed to you. 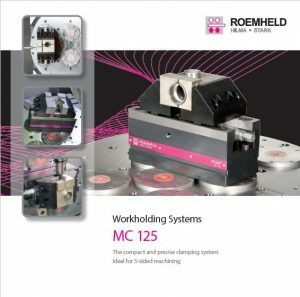 Overview of the Products offered by the Roemheld Group including products for Workholding, Quick Die Change, Quick Mold Change, Machine Vises and Products for Assembly. 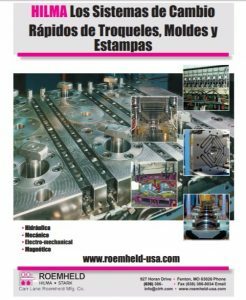 Catalog of products for creating Quick Die Change Systems and Quick Mold Change Systems. Products include Clamps, Die Lifters, Hydraulic Power Units, Valve Packages and Accessories. 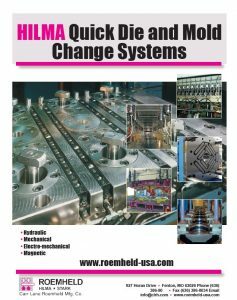 Brochure summarizing the vast array of products offered by Hilma to create a Quick Die Change System. 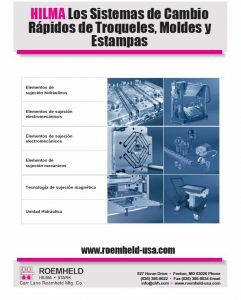 Brochure highlighting application examples of Quick Die Change and Quick Mold Change systems. 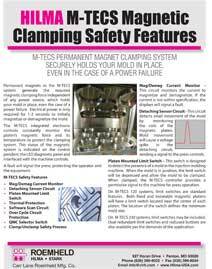 Each example highlights a different clamping option and how it was specifically chosen for the application. 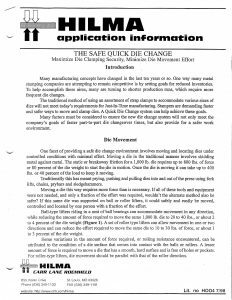 Product summary of our Quick Die Change systems. 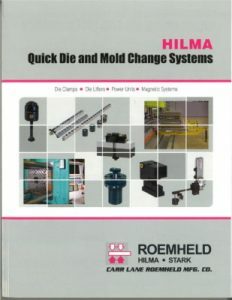 Brochure explaining considerations for implementing a Hilma Quick Die Change System. Includes considerations of your existing press and products available to suit your needs. 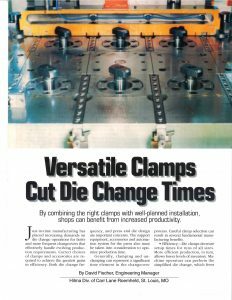 News Article showcasing products used in implementing a Quick Die Change System. 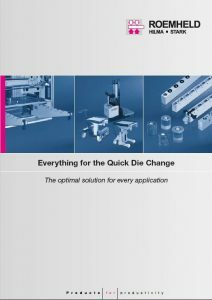 Brochure designed to give guidance on taking the first steps into Quick Die Change. 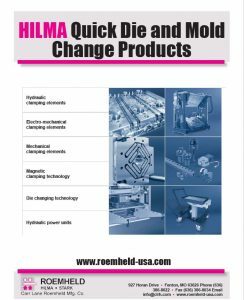 Article taken from MetalForming magazine showcasing how implementing a Quick Die Change System from Hilma can reduce your set-up time and increase productivity. 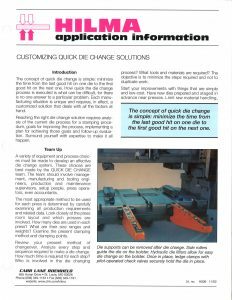 Brochure highlighting the process of Quick Die Change for Forging Applications. 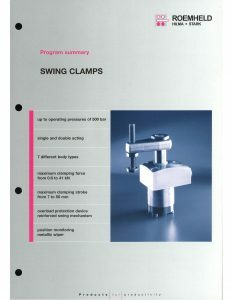 Brochure describing our Magnetic Clamping Systems. Systems typically consist of Magnetic Platens, controller and control box. 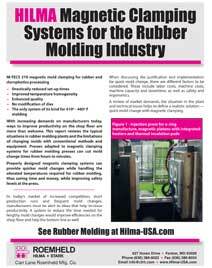 These systems can be used in Injection Mold Machines, Rubber Mold Machines or Stamping Presses. 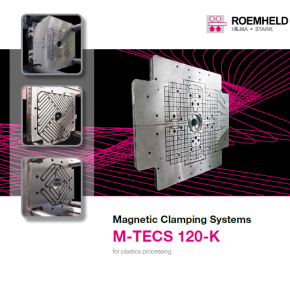 M-TECS is a magnetic clamping technology that sets standards for magnetic quick change systems for the plastics processing industry. 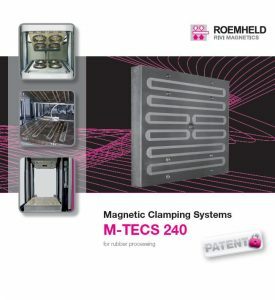 M-TECS 120 and M-TECS 240 operate with an electric permanent magnet. Special long poles give maximum safety, maximum force, and perfect reliability. 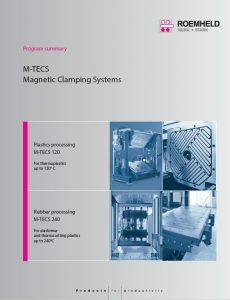 Brochure describing HILMA M-TECS 120-K magnetic clamping systems for plastics processing, which uses long pole or square pole technology, or a combination of the two. Numerous safety features make this an ideal choice for quick mold change on plastic injection mold machines. 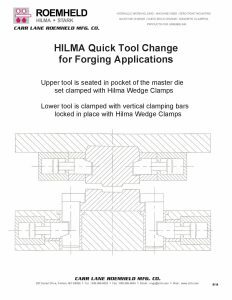 Brochure describing HILMA M-TECS 240-K magnetic clamping systems. 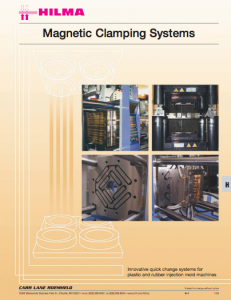 This brochure describes the advantages and applications of magnetic clamping systems for rubber molding, along with a step by step description of how magnetic platens are used. Find out how to determine the cost benefits, and how this would increase efficiency on the shop floor. 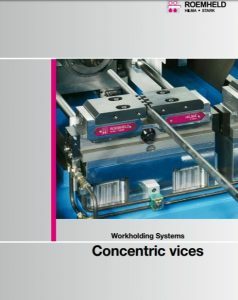 Concentric Vises for workholding systems are hydraulically operated and give you the benefit of high repetitive clamping accuracy and high stability and good protection against swarf. The ultimate power of high precision, the MCP-series vise is capable of seven separate operations in a single pass. MCP is a lifetime vise that grips safely on as little as 3mm, saving you money on material costs. 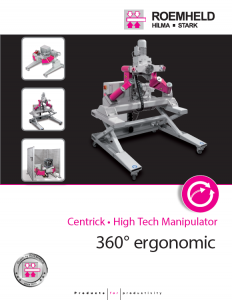 16 page brochure detailing the Carvesmart original dovetailed quick change vise jaw system, which reduces set-up time and improves part quality. The system is a complete package that reduces downtime and improves quality with speed and flexibility. 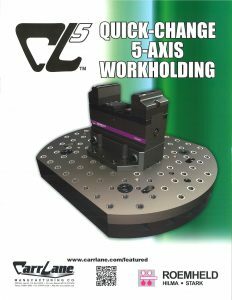 Increase your spindle time and profits with creative workholding solutions from Carvesmart, offered by Carr Lane Roemheld. 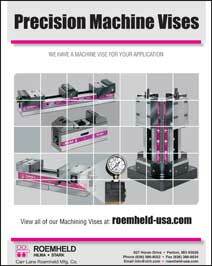 Product overview of Hilma Machine Vises. Includes case study and application photos. 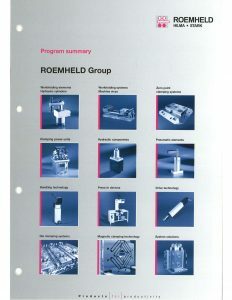 Brochure outlining the extensive range of Roemheld Swing Clamps. 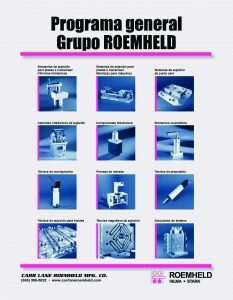 Brochure highlighting the extensive range of Work Supports offered by Roemheld. 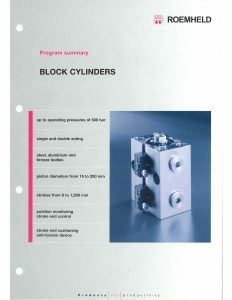 Brochure outlining the extensive product offering of Block Cylinders. 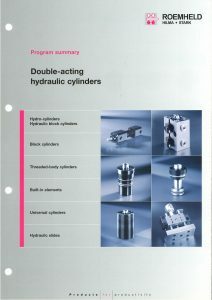 Brochure of Block cylinders, Threaded-body cylinders, Built-in elements, Universal cylidners and Hydraulic slides. These double-acting cylinders are available in an array of shapes and forces to fit your needs. 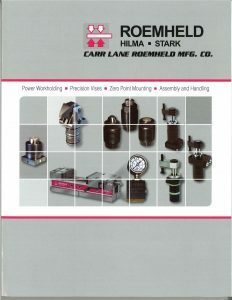 Assembly Products Catalog. 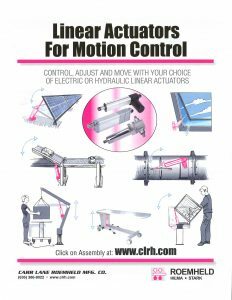 Highlights products used to create and build ergonomic workstations for assembling. 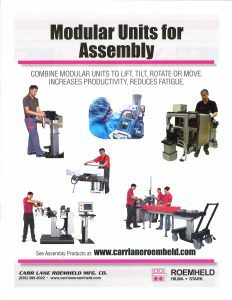 Brochure of our Assembly Products. 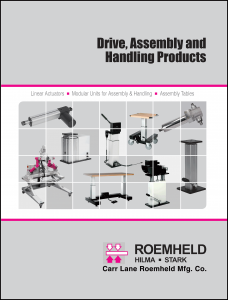 Shows application examples on how our products can streamline your assembly workstations. 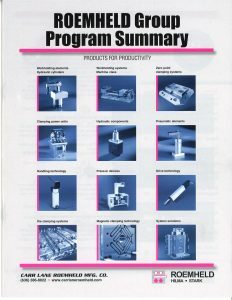 Brochure of Linear Drive units. 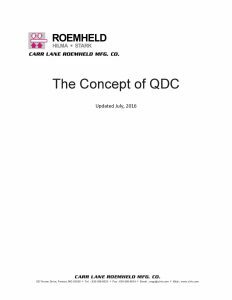 Includes summary of product offering and application examples. Drive units are typically used in manufacturing, agriculture, mining, medical devices and industrial applications. 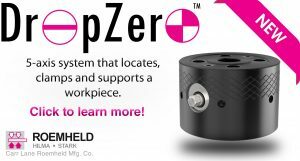 Learn more about our Drop Zero 5 Axis manual locating and clamping system. The Drop Zero system reduces setup time and fixture costs. It can also be used with non-modular tooling. The components elevate the work piece for machine spindle clearance to allow access of 5 sides of the part. 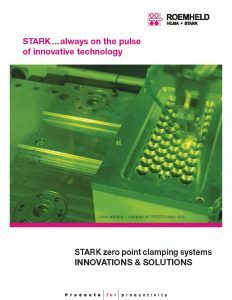 Stark Zero-Point Mounting and Clamping Systems will streamline your changeover process. 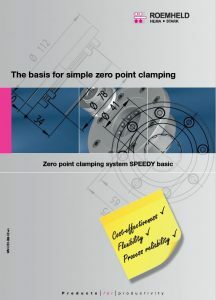 Learn more about the Stark Zero Point Mounting Clamping System, SPEEDY Basic. SPEEDY basic is a compact design with high clamping forces, and can be actuated hydraulically or pneumatically. Zero Point Systems – SPEEDY Classic. 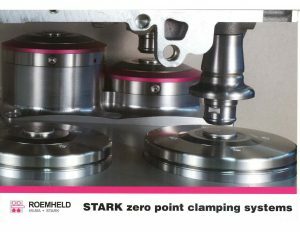 Learn more about the Stark Zero Point Mounting Clamping System, SPEEDY Classic. 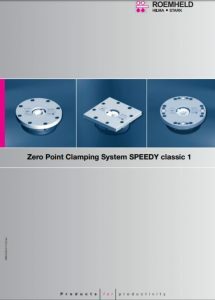 SPEEDY classic is the most comprehensive and versatile zero point clamping system. It has four sizes and numerous variants including clamping check, mount control, clearing device and media ducts. 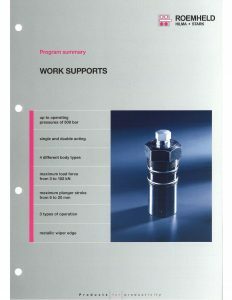 Brochure highlighting the Zero-Point Mounting system. Includes information about our company, quality and case studies. 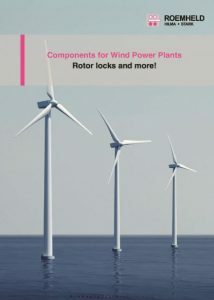 Components for Wind Power Plants – Rotor Locks and More! 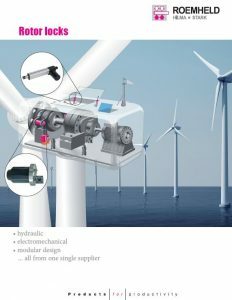 To provide the maximum possible protection for employees and the required safety at work, ROEMHELD has developed – for the operators and manufacturers of wind power plants – a hydraulic and electromechanical rotor lock that safely, reliably and quickly locks the rotor blade during maintenance works. Rotor locks are used to lock the rotors of large off-shore wind turbines to enable maintenance work to be carried out. The double-acting hydraulic cylinder generates the extend-ing and retracting movement of the bolt and retains it in the locking position. 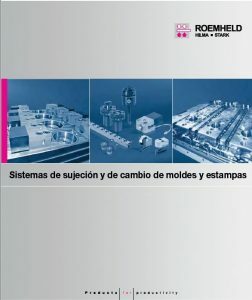 Spanish catalog of products for creating Quick Die Change Systems and Quick Mold Change Systems. Products include Clamps, Die Lifters, Hydraulic Power Units, Valve Packages and Accessories. En Español: Los sistemas de cambios rápidos Hilma se adaptan a incontables requerimientos de sujeción de dados con diferentes dimensiones y pesos. Muchas de éstas aplicaciones son especiales utilizando clamps estándar que cumplen los requerimientos del cliente y les permiten reducir dramáticamente sus tiempos de sujeción en una operación segura y rápida, en corridas cortas o regulares de producción.